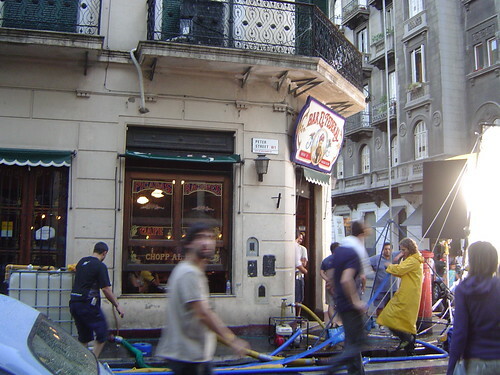 Seems like more and more film crews are popping up in San Telmo. Whether they’re for commercials or movies, I don’t know. Coming back from Walrus Books late Sunday afternoon we saw that the corner of a popular tourist hangout, Bar El Federal, had been transformed into a piece of London. 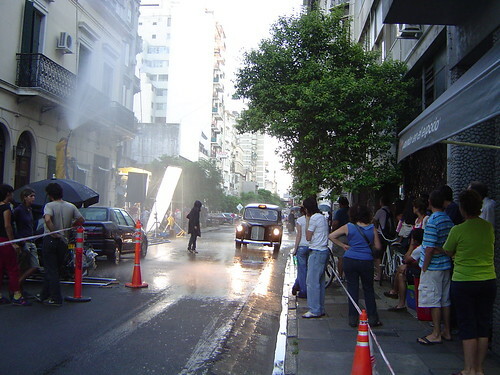 We came across the site just as the final scene was being filmed. There’s the black taxi from London and the actress in a hooded black outfit. Off to the left was a guy holding a water hose that produced the “rain”. And notice the fake street sign on the side of Bar El Federal as calle PerÃº momentarily became Peter Street, City of Westminster. This post inaugurates a new category – On the bus – an occasional series of anecdotes from travels on the city buses. Growing up in a small town outside Nashville I often heard country music playing somewhere almost every day. No surprise that in Buenos Aires I’ve rarely heard country music. But today as I hopped aboard the #17 bus in Recoleta the driver was playing country music on the radio. I didn’t even know there was a country music radio station in Buenos Aires. Unfortunately, it wasn’t the traditional country sounds of George Jones or the edgier, hardly country, Johnny Cash but the twang of Brooks & Dunn or some other modern, commercialized country music act. The #17 starts somewhere around Plaza Francia, so there’s hardly any riders as it passes through Barrio Norte. But the bus fills up as it passes through downtown on the way to the southern parts of the city. 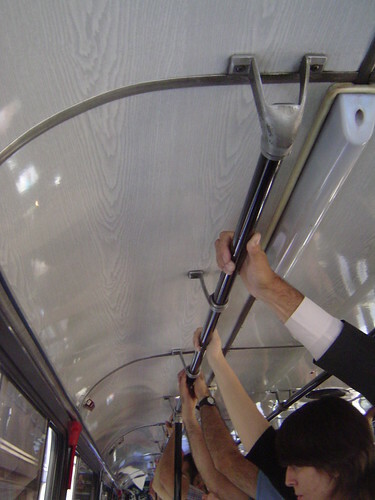 Ultimately, the bus becomes jam packed as all those who must ride standing grasp the overhead rail. 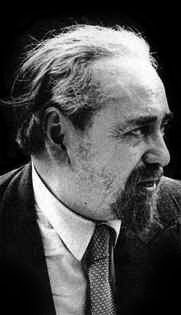 January 24th marks 40 years since the death of the Argentine poet Oliverio Girondo. As a leader of the avant garde in 1920s Buenos Aires, Girondo wrote a manfesto in the fourth issue of the literary magazine Martín Fierro in which he railed against the literary establishment of the day, the “impermeabilidad hipopotámica del ‘honorable publico’“. Girondo joined forces with others to create a new publishing venture for young writers that they called “Sociedad Editorial Proa”. Girondo was born August 17, 1891 in a house on calle Lavalle. (The house was on a block later demolished to make way for Av 9 de Julio). From a wealthy family Girondo first traveled to Europe when he was nine. Later, Girondo traveled extensively, making many return trips to Europe. While living in Paris in 1922 Girondo produced his first book of poetry, Veinte poemas para ser leídos en el tranvía. Girondo republished the book a couple of years later in Buenos Aires. After again traveling and living in Europe, Girondo returned to Buenos Aires in 1932. In 1932 Girondo published one of his most famous works, Espantapájaros, which had a rather infamous publicity campaign. In 1943 Girondo finally married his longtime lover Norah Lange, much to the disgust of Girondo’s chief rival Jorge Luis Borges. Throughout the 1940s Girondo continued to serve as a mentor to young Argentine writers. In 1956 Girondo published what some call his landmark work En la masmédula. 1961, Girondo was leaving a cinema on Av Sante Fe when he was struck by a car. The accident left him with diminished capacity for the remainder of his life. Died January 24, 1967 at age 75. One of my favorite historical topics is the intellectual and cultural history of the early twentieth century. Recently I’ve been reading a book titled Yrigoyen Entre Borges Y Arlt (1916 – 1930). 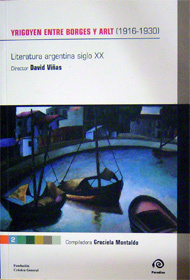 It’s the second volume in a planned seven volume history of Argentine literature during the twentieth century. The series is edited by the writer David Viñas. As its title suggests, the book says a lot about the political and social aspects of the times as well as literature. Historical periods never follow calendars very clearly. Rather than focusing on just the 1920s, the book uses the two presidencies of Hipólito Yrigoyen as the cornerstones of the time period. The 1916 presidential election was the first under the Sáenz Peña law, which reformed the election process with compulsory voting by males over the age of 18. At the time Argentina was undergoing massive transformation, particularly impacted by immigration. In 1916 more than 50% of the population of Buenos Aires were immigrants who brought their own languages, cultures, and ideologies to the city. (Robert has an interesting post on the housing projects built for immigrants). From a literary angle, the population increase also raised the number of potential readers and consumers of newspapers, magazines, and books. Architecturally, the city transformed into a modern metropolis with an urban landscape very different from its 19th century version. While any such period of rapid change may bring a sense of nostalgia and melancholy, those same perceptions often lead to resentment and prejudices. For a generation before even 1916 the threat of the immigrant to the traditional Argentine culture had been a focus of many writers, from which emerged a type of cultural nationalism. A corresponding political nationalism was quite active in this period. Of course, Argentina was hardly alone among countries with conflicts between nationalist attitudes and socialist perceptions. One now distant event, the 1917 Russian Revolution, was then a prominent aspect of the political-cultural world. It was a turbulent time with massive strikes and social unrest, but the times also brought the construction of so many grand buildings that define the landscape of Buenos Aires. Most of the book covers the 1920s. Alvear was president from 1922 – 1928, succeeded by Yrigoyen who would be overthrown by a military coup in 1930. Borges returned to Buenos Aires in 1921 after spending many formative years of his youth in Europe. He and others brought the avant garde movement from Europe to Buenos Aires. During the 1920s a large number of small, literary journals flourished in Buenos Aires. On the pages of these publications were debated the cultural perspectives of the city. An appendix to Yrigoyen Entre Borges y Arlt provides a chronology of the important books, magazines, poems, plays, and essays published in Argentina between 1916 – 1930. More than forty literary magazines are listed for this period. Of course, the book features chapters on Borges and Arlt. Other chapters cover writers such as Lugones, Girondo, Quiroga, Guiraldes, Baldomero Fernandez Moreno, and more. There is also a chapter devoted to “Florida and Boedo” literary rivalry (which deserves a blog post all of its own) and a chapter on women writers of the time such as Alfonsina Storni and Norah Lange. There’s a lot in this book and I’ll probably be dipping back into it for some future blog postings. Another appendix also includes a summary of political events for the years covered, providing a nice overview of the period. I’m looking forward to other volumes in this series on 20th century Argentine literature. If you’re not seen Comet McNaught, then you’ve missed a spectacular sight. I took a couple of photos Sunday night from the roof of our building but the photos are not great. The lights from the nearby Clarín building are way too bright and there’s not an interesting foreground. Also, the photos are really grainy but it gives you an idea of the size and brightness of the comet. Oh, how I wish to live in dark sky country. For the story behind how the comet was first spotted late last year, see the home page of its namesake Rob McNaught who spends his time in Australia searching the southern sky for asteroids and comets that pass close to earth. There’s some fascinating stuff on that site if you’re at all interested in astronomy. Another history of the comet along with a spectacular photo from Australia on Gary W. Kronk’s Cometography site, including some images of the comet visible in broad daylight. Lately I’ve blogged about my street, Av Caseros, so I figured it’s a good time to talk about the place behind the name. Caseros, in addition to being a street in the southern part of the city of Buenos Aires is also the name of a town to the north of the city. The street is named for that location, which is known for a major battle of the mid-19th century. Here’s a question for the Argentine guys among my readers: Do boys here grow up reading about the great battles and wars of Argentine history? As a lad I remembered being engrossed in the details of the American Revolutionary War and Civil War. Particularly as a boy from an old Southern family in Tennessee, I learned about the exploits of the Confederacy in fighting the Yankees. And I’ve been to my share of battlefields, those state and national parks that conserve the land on which those conflicts were fought. (Are there any battlefield parks in Argentina?) While I’ve not been to any Civil War re-enactments (even when I lived in Virginia), my family does have a few Confederates in the Attic . So, I’m wondering if this phenomenal obsession with the military heroics of the past is something that you grow up with in Argentina? Or, does the horrors of military dictatorships color the perceptions of an Argentine boy about the country’s military history? I’m just curious. Of course, I suspect boys growing up in military families have a very different perspective but I’m wondering about the “typical” perspective (whatever that is). 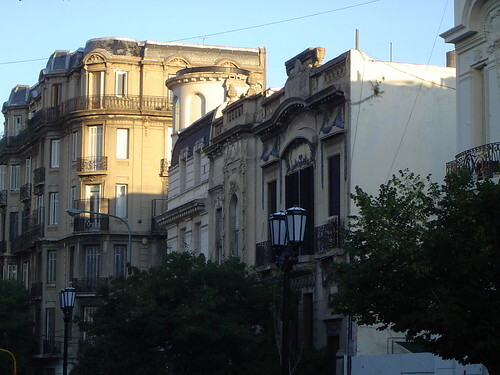 Avenida Caseros takes its name from the Battle of Caseros, a turning point in Argentine history that occurred on February 3, 1852. For much of the first half of the 19th century Buenos Aires was ruled by Juan Manuel de Rosas. While Rosas had the support of the urban poor, his decades long rule was marked by state terrorism and ruthless vigilante squads that sought out his opponents with bloody reprisals. (To make a very long story short, I’m omitting a lot about the political context of early 19th century Argentina). Justo José de Urquiza, who controlled the Entre Rios province north of Buenos Aires, rebelled and started building his own army to challenge that of Rosas. Urquiza built a large army with soldiers not just from the northern provinces of Entre Rios and Corrientes but also with soldiers from Brazil and what is now Uruguay. Urquiza’s army of more than 25,000 men advanced on Buenos Aires and met Rosas army of nearly equal size at Caseros, which at the time was a rural area located just north of the city of Buenos Aires. It was one of the largest battles to be fought in the Americas up to that time. But the fighting was slow. The men were armed with smoothbore flintlock muskets that required fourteen steps to load, firing approximately one shot per minute. Many in the cavalry fought with crude lances, often nothing more than bamboo poles with a knife blade or sheep shearing clippers tied to the end with strips of rawhide. Rosas also enlisted Indian squads as irregular cavalry. The battle began just after eight in the morning. At ten Urquiza advanced one division of his cavalry in a maneuver to outflank Rosas infantry. The resulting cavalry charge was so fast and furious that the dust rising from the charge caused the cavalry to completely miss the enemy, riding right pass them. Nevertheless, Urquiza himself led another cavalry charge that was successful. Several battalions under Rosas command mutinied and killed their own commanders. Seeing that defeat was inevitable, Rosas quietly made his way away from the battle zone, hiding out in Buenos Aires for a day before boarding a British vessel for exile in England where he lived until his death twenty-five years later. By three in the afternoon Urquiza had rode into Buenos Aires and established headquarters at Rosas house in Palermo and commenced a bloody purge that resulted in the deaths of hundreds of Rosas supporters. (Rosas’ estancia was located on the land that is now Parque 3 de Febrero, ironically named after the date of the Battle of Caseros). The fall of Rosas in 1852 started a new phase in Argentine history, the era that would eventually bring the development of modern Argentina. Urquiza, however, wouldn’t enjoy for long his role in bringing down Rosas as politicians clad with swords and their own armies would wrestle over control of Buenos Aires throughout the remainder of the decade. 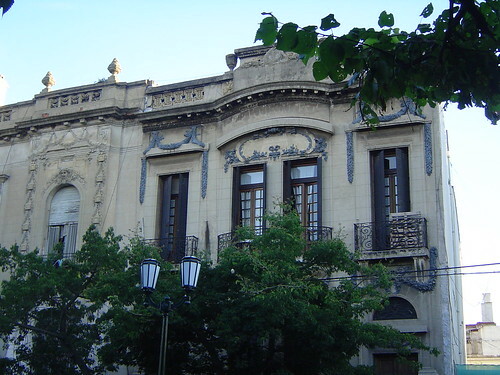 Eventually returning to his home province of Entre Rios Urquiza solaced himself by building the largest house in Argentina at that time (Palacio San Jose). Urquiza was killed in his own home by his political enemies in 1870. Changes are underway at local TV station canal 9 after Mexican media mogul Angel Gonzalez (who now lives in Miami) brought 80% of the TV station. I’m not sure if this was related to the sale or was a long-term plan but the former studios of Canal 9 overlooking Av 9 de Julio are to be demolished for a new apartment building. Too bad they’re not making more creative use of this building, perhaps even just maintaining the facade and cupola. The replacement appears to be simply yet another, bland, generic apartment building. In my last post I mentioned that I would say more about this block of apartment buildings on the 400 block of Av Caseros. I adore this set of buildings, designed by the architect Christian Schlinder and completed in 1910. I was intending to say more about these buildings but I couldn’t find the books to verify my information. So, being a good librarian, I’m not going to say more about it until I verify my source. Anyway, I wanted to go ahead and post the photo. I tend to say that I live in San Telmo but, in actuality, Av Caseros is the boundary of the two barrios and the south side of Av Caseros is Barracas. So, these buildings also are located in Barracas rather than San Telmo. If you find yourself anywhere near Parque Lezama, then just wander a block down Defensa and take a look at the marvelous 400 block of Caseros. Whenever I walk by these buildings I find myself thinking about the New Town area of Edinburgh. There’s a slight similarity in style but New Town just happens to have dozens of streets with incredible apartment buildings. Perhaps because I like cold, dreary weather, but I wouldn’t mind living in Edinburgh someday….meanwhile, I’ll just continue reading Ian Rankin. Despite that, I still love Buenos Aires. 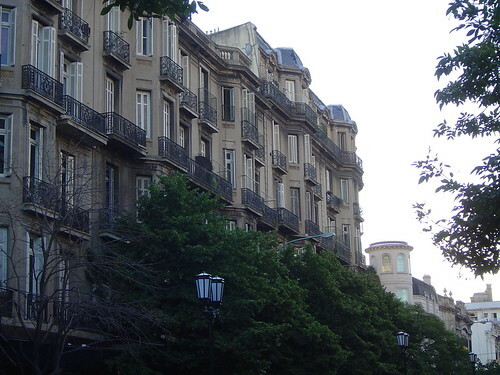 A message from a good friend of mine from college who is now an architect prompts me to write about the buildings on the street where I live in Buenos Aires. (Shout out to Jim!). The city has been doing a lot of work on this street, new sidewalks and strip of grass planted down the center. Well, the median is still mostly dirt but notice the new old-fashion street lights that now grace Avenida Caseros. Our building is the one on the right in the photo above. Below is another photo, a closer shot. Long-time readers also may remember a post about when we moved to this place last year that features photos of the interior. I don’t really care for the black trim around the windows, a little funereal for me, but the building is outstanding. Almost all the buildings on this part of Caseros are very interesting. Most are in good shape, though there are still a few that need a lot of work. I’m going to have more to say about that building in the background of the top photo.